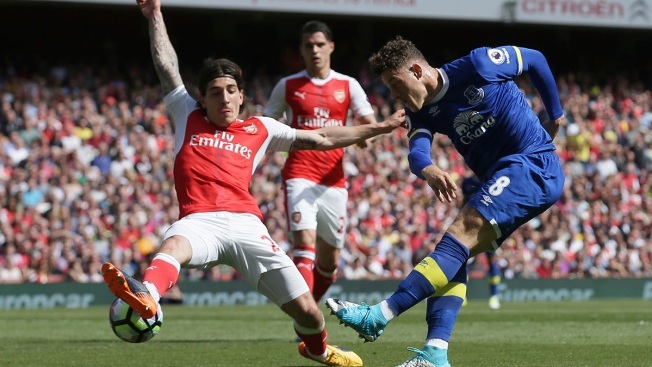 In this May 21, 2017, file photo, Arsenal's Hector Bellerin blocks a shot from Everton's Ross Barkley during the English Premier League soccer match at The Emirates stadium in London. NBC is moving its Premier League studio show to England for the season openers for the first time. The network said Wednesday that Rebecca Lowe will host broadcasts on site from Aug. 11-13 with a rotating group of the network's analysts and commentators. The Premier League season opens on a Friday night for the first time on Aug. 11 when Arsenal hosts Leicester, a match called by Arlo White and Kyle Martino. Brighton, in the top division for the first time since 1982-83, hosts Manchester City on Saturday, with White and Robbie Earle commentating. The weekend concludes with Manchester United hosting West Ham on Sunday, with White and Robbie Mustoe the broadcasters. Lee Dixon and Graeme Le Saux, who are White's usual broadcast partners, will be part of pitch-side and studio coverage for about 21 hours of on-site broadcasts. The network gains extra access to players and managers when it moves its coverage to the stadiums. "It has that feeling of let's just get going. Everyone's in a great mood because no one got injured yet. There's been nothing negative yet," Lowe said. "There's always so much hope at the start of the season." NBC made road trips from its studio in Stamford, Connecticut, in each of the last three Aprils. "It will certainly kick off this season in a bit different way than the last four," Lowe said. "It certainly does add that closeness, that proximity."